Update, Sept. 17: iOS 12 is out today! Apple hasn’t released iOS 12, the latest update for the iPhone and iPad, but I’m ready—and you can be, too! I’ve updated my book A Practical Guide to Networking, Privacy, & Security to cover iOS 12 based on the latest public beta releases, which are close to the final version. You’ll receive free updates to this edition if anything changes after release or for any future changes to iOS 12. The book offers background information, explanations, and illustrated, step-by-step instructions across a wide range of topics, from connecting securely to Wi-Fi networks to setting privacy preferences for Siri and Safari to blocking unwanted calls and Web trackers to finding your phone or tablet when it’s lost. The 186-page is long, but not daunting. I wrote it so that you can easily find a topic you want, like Bluetooth pairing or using AirPlay, and then dip in for that information. You don’t need to read it cover to cover to get a benefit, but you’re more than welcome to! You can read more about the book, see sample pages, read a full list of topics, updates for iOS 12, and the table of contents at the Practical Guides page. You can also order directly via the Add to Cart link on this post! For a 25% discount, subscribe to my low-volume email list, which I use to send occasional updates about books and projects as I release them. 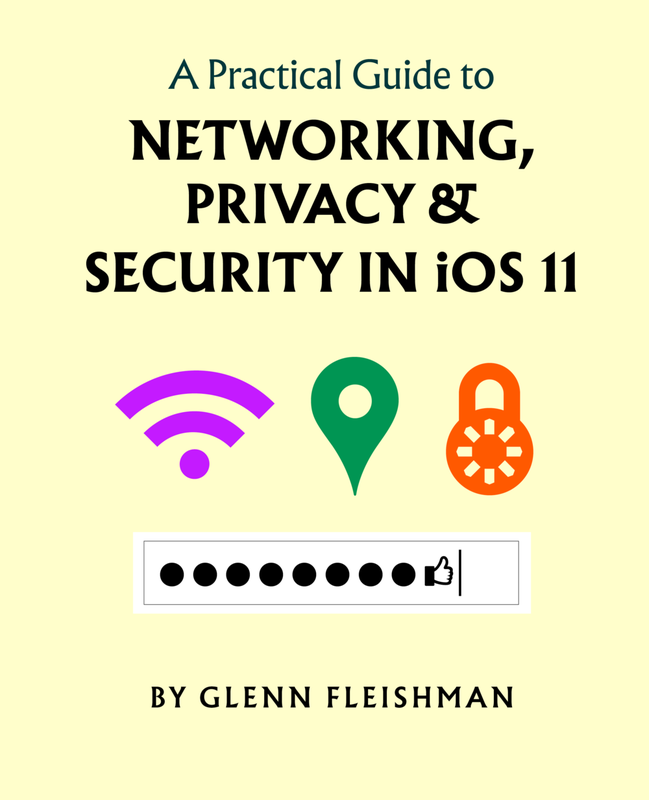 I’ve just released A Practical Guide to Networking, Privacy, and Security in iOS 11, the latest version of a book about those three topics that I’ve been updating for about seven years in a couple of different versions. My intent is to give you everything you need to manage networking—Wi-Fi, Bluetooth, cellular, Personal Hotspot, AirPlay, AirDrop, and more—as well as all the ins and outs of what Apple does with your private data and how it controls and restricts access by third-party apps and Web sites to you while you use an iPhone or iPad. I also explain how to pick good passwords, turn on two-factor authentication, use passcodes and Touch ID, and find your missing iPhone or iPad. It's a reference work—you probably won't want to read it end to end! But whenever you have a question about any of these topics, it’s there to refer to you. You can purchase it directly from me via the link below, and you get a DRM-free ebook in three different formats, so you can read it anywhere you want on any device. The price includes any updates to this iOS 11 edition. Read more about the book here, including a downloadable excerpt and table of contents. If you purchased any previous edition, you’re entitled to a low-cost upgrade; contact me if you didn’t receive email or other notification. If you’d like this book in print, you can purchase a print-on-demand edition via Amazon. You've seen all the coverage about hacked accounts and stolen private images and data. We at Apple are appalled about this and as soon as we were alerted, began days of auditing, and immediately fixed problems that abetted the password cracking related to iCloud that led to some of these breaches. You trust us with your most personal details, and we take this seriously. The possession and disclosure of private data is a crime. Make no mistake: This isn't funny and the victims should not be blamed for trusting us and others. No one should be sniggering, shaming, or pointing figures. Criminals stole people's information and then released it. We will do everything in our power to assist law enforcement to track them down for prosecution. We have already taken some steps, and in the next two weeks will take more. We can do better.